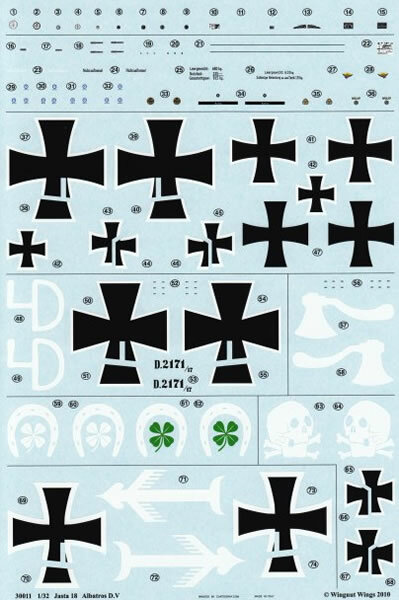 These are very comprehensive decal sets from Wingnut Wings. They supply more than just the relevant national and personal markings, so there’s plenty left over for the spares box. The level of research means that each subject can be tackled with confidence and the diverse assortment of schemes is also pleasing. Some of the options presented here have “lozenge”covered wings. For reasons of economy, this material is not included in these releases. 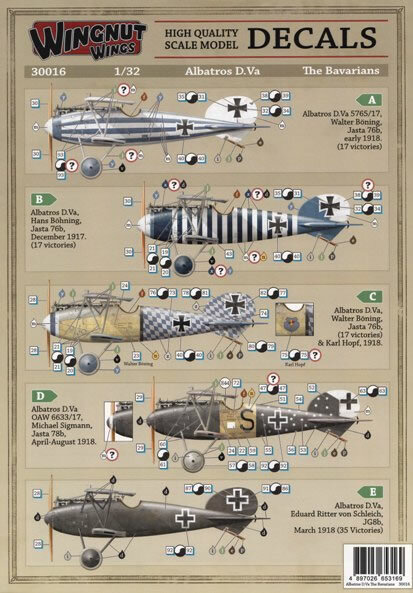 Modellers will have to seek it elsewhere as at the time of writing it is not available separately from WNW, nor is it found in their present range of Albatros D.V/D.Va donor kits. 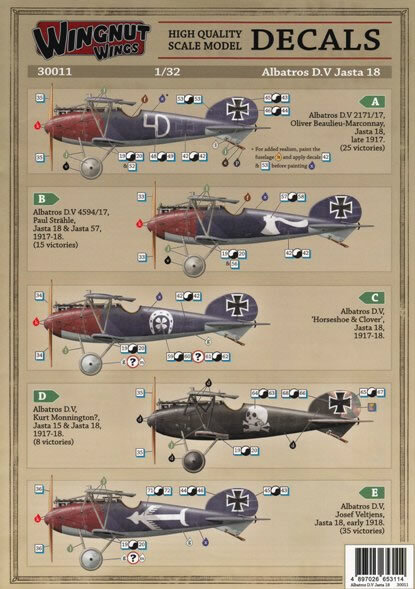 Some of the best liveries can be found on the Albatros series of fighters. 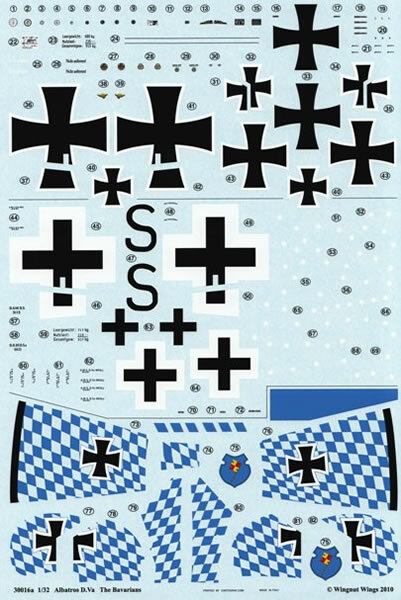 The combination of Jasta colours and personal markings make them a firm favourite amongst builders of the German Air Service. Wingnut Wings have released kits of both the D.V and D.Va. 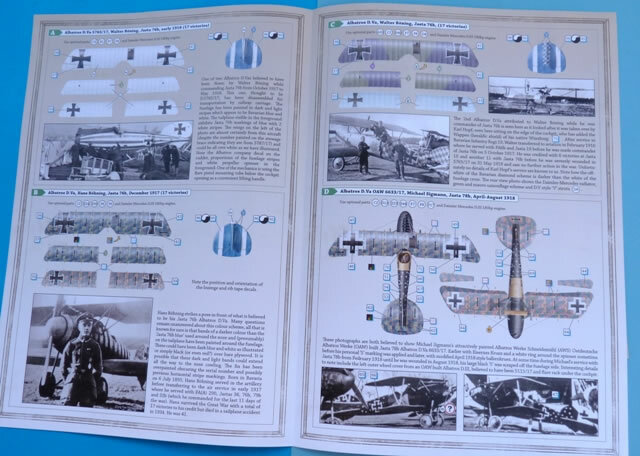 The quality of these products is undeniable and many modellers have made multiple purchases. So if you want a scheme that’s different from those found in the box, then these two new releases can help. Each comes on an A4 sized sheet of decal paper (plus a smaller leaf for #30016) and is printed by Cartograf in Italy. As such the quality is up to the high standard found in the kits themselves. Every item is printed with perfect colour registration and is surrounded by a minimum of carrier film. They are quite thin but do stand up to the rigours of pushing and prodding when being positioned on the model. Decal setting solutions will work extremely well but it is advisable to stay clear of the stronger solutions. What surprised me about these sheets is the sheer number of extra items to be found. Not only do we get the usual national and personal markings but we also get a wealth of stencil data. Included in this lot are instrument dials, propeller logos, data plates, datum lines, rigging diagram, weight tables and much more. It’s all legible under a magnifying glass which is a credit to the printers. Albatros D.Va, serial 5765/17, flown by Walter Böning of Jasta 76b, early 1918. Fuselage – blue and white horizontal stripes, Wings – white for both upper surfaces and undersides. Albatros D.Va, serial unknown, flown by Hans Böning of Jasta 76b, December 1917. Fuselage – Dark blue (or black) and white vertical stripes, Wings – 5 colour lozenge with blue upper and lower rib tapes. Albatros D.Va, serial 5765/17, flown by Walter Böning of Jasta 76b and Karl Hopf, 1918. Fuselage – blue and white diamonded rear, Wings – mauve and green upper surfaces with light blue undersides. Albatros D.Va OAW, serial 6633/17, flown by Walter Böning of Jasta 78b, April-August 1918. Fuselage - black nose and rear with black “S” and white stars. Wings – 5 colour lozenge with pink upper and lower rib tapes. 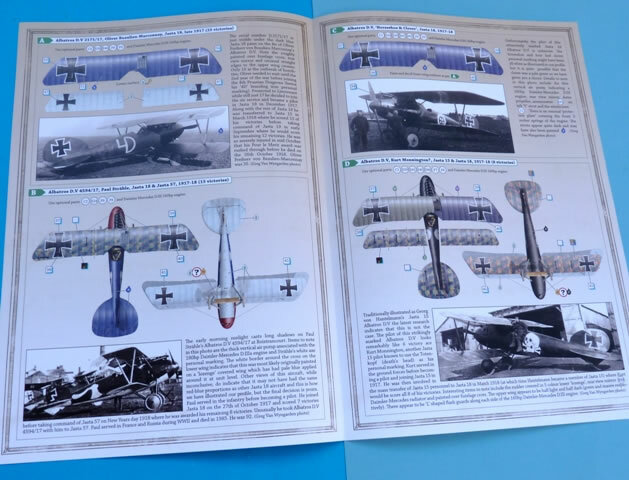 Fuselage – black, Wings – 5 colour lozenge with blue upper and lower rib tapes. Albatros D.V, serial 2171/17, flown by Oliver Beaulieu-Marconnay of Jasta 18, late 1917. Fuselage – red and blue with white “4D”, Wings – blue upper surfaces with light blue undersides. Albatros D.V, serial 4594/17, flown by Paul Strähle of Jasta 18, 1917-1918. Fuselage – red and blue with white axe, Wings – 5 colour “lozenge” upper surfaces with blue rib tapes and light blue undersides. Albatros D.V, serial unknown, pilot unknown of Jasta 18, 1917-1918. Fuselage – red and blue with white horse shoe and clover, Wings – blue upper surfaces with light blue undersides. Albatros D.V, serial unknown, possibly flown by Kurt Monnington, Jasta 15 & 18, 1917- 1918. Fuselage – black with white skull, Wings – top wing blue upper surfaces and light blue undersides, lower wing 5 colour “lozenge” with pink rib tapes. Fuselage – red and blue with white winged arrow, Wings - mauve and green upper surfaces with light blue undersides. There is plenty of variety on these sheets and the schemes are sufficiently different to suit all tastes. The quality of the printing is excellent and the level of research is first-class. To keep costs down, 5-colour “lozenge” hasn’t been included in the package but will be available separately as #32001, #32002 and #32005 (assortment of rib tapes). At the time of writing, these were not yet available but there are other manufacturers ready to take up the slack.